The calendar says it is almost Spring. Let’s hope it is right. I love snow! I have always liked it, but since I retired I just love it. I can sit at home and watch others slip and slide as they go on their way. But, this year I’m looking forward to warmer days and getting outside. With the new spring in our step, let’s spring into action and have some fun with our Brothers and Sisters in the Grange. We have a new word in Cheshire. It is “voluntold”. Meaning – you are being told you are volunteering. 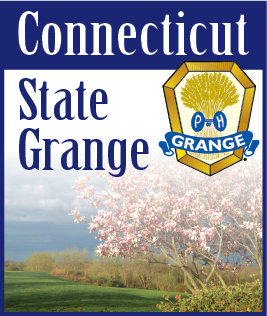 Well last year our State Master voluntold me that I was presenting a program for the Grange that won the Deputies' Ritual Challenge. The winner was Redding Grange. On April 9th I will be presenting that program. This would be an excellent way for you to celebrate the start of Spring. It may also be the one and only time that you can and should boo your State Master, General Deputy, Pomona Deputy West and the Inspecting Subordinate Deputy. They will be in competition. You can cheer for your favorite or the underdog. You can also boo them and there is nothing they can do about it. It is all part of the game. You will learn about your Brother and Sister Grangers, you will hear some jokes, you will hear some very different songs and I’m sure you will have a laugh or two. That’s Monday, April 9th beginning at 7:30 p.m. Mark your calendar now. Redding is one of only a few Granges that I have trouble finding. I think I go a different way every time I go there. For those of you with GPS their address is 399 Newtown Turnpike, Redding. Hope to see you in Redding and around the State.